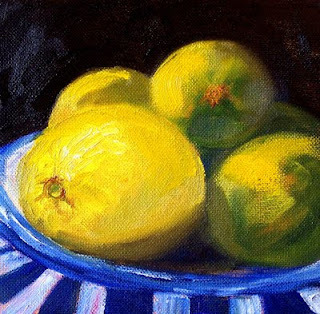 I think a lemon binge has hit; second lemon painting of the week. This 5x7 inch oil painting on a hardboard panel is for sale at Small Impressions Gallery for $50.00 plus $6.50 for shipping to US addresses. It is one of several small oil paintings completed on a black panel. I like the mood created on these little panels. 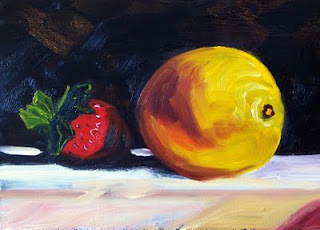 Here's another of my little fresh fruit paintings. This one is 6x6 inches on a canvas panel. I set the still life up in my studio with a dark paper foreground and black fabric pinned in the background. A couple of plates that I have painted before served to hold the citrus. I have a little desk lamp, a high intensity one, that focuses from one side and creates just the right amount of light. This painting will eventually be for sale at Small Impressions Gallery at Etsy along with some of my other affordable canvas panel paintings. One of my favorite activities is buying colorful produce just for painting. 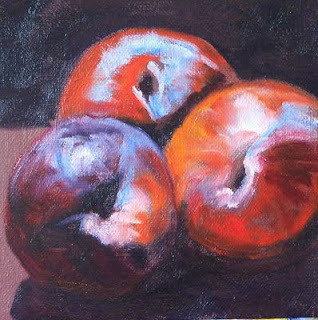 This little 6x6 inch oil painting is the result of a recent trip to the grocery store. 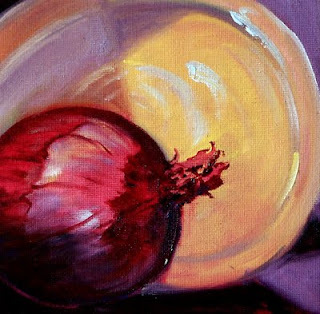 I loved the rich red of this colorful onion. It was fun to paint the dry stem and papery skin while it sat in front of a butter colored plate. I also have some lemons and limes sitting in my refrigerator. They may end up on canvas, too, joining some of my other small still life paintings for sale at Small Impressions Gallery. This little painting can be purchased for $36.00 plus $6.50 for shipping to US addresses. 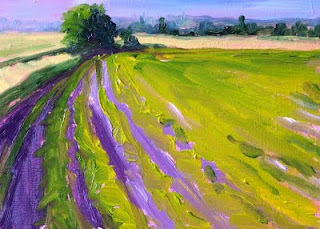 Although they are far and few between, it is the sunny days of autumn that inspire many of my landscape paintings. I love the trees as they begin to turn red, yellow, and orange. Nothing is as refreshing as speeding down a path on my bike, feeling the fresh air, and glimpsing the beautiful colors of fall. 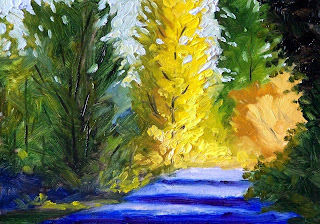 This little 5x7 inch oil painting was inspired by one of those sunny autumn afternoons. It is painted with especiallly thick paint and has a rich texture. As a celebration of autumn, I listed it for sale at Small Impressions Gallery for $50.00 plus $6.50 for shipping to US addresses. 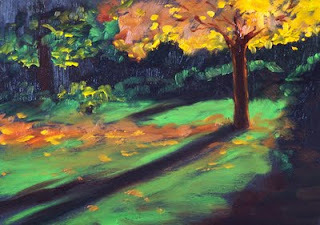 Along with this painting, there are a number of other autumn themed paintings at affordable prices in the collection. Yesterday was a glorious fall afternoon and I was able to get outside after days of rain and showers. My bike and I went to the Foothills Trail in Pierce County and enjoyed the fresh air, sunshine, and lovely fall scenery. Round trip the trail runs 30 miles. I was feeling great, pedaling away, taking reference photos, and then I got a flat tire. My speedometer displayed 12 miles. Visions of a long walk crossed my mind, but I had a spare tire and a pump. I've only changed a tube once before. The questions lingered, could I do it again? Could I remember how? Sitting by the side of the trail, I removed the tire, put in the new tube, and my husband pumped like crazy with the little hand pump. Amazingly, in ten minutes and we were ready to go, stopped at Trailside Cyclery in Orting for more air, and made it back without incident. 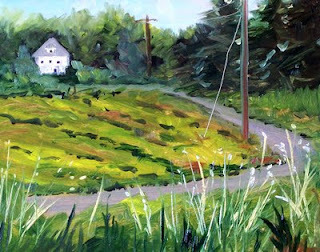 Today's 8x10 inch oil painting is based on one of the old farm houses that sits along side the trail. I love the area because of its rural atmosphere. We passed pumpkin patches, corn mazes, and rivers full of fishermen. I'm anxious to paint some more of my memories of this little adventure. 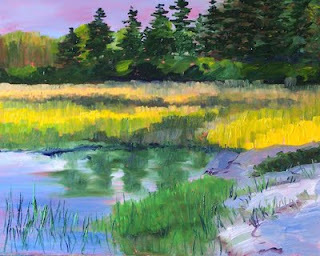 This painting has joined some of my other landscape oil paintings at Impressions Gallery and can be purchased for $125.00 plus $12.00 for shipping to US addresses. The edge of a marsh inspired this 8x10 inch oil painting. The painting is for sale at Impressions Gallery for $125.00 plus $12.00 for shipping to US addresses. It is sold unframed, but will slip easily into a standard sized frame. Today's 8x10 inch landscape oil painting can be purchased at Small Impressions Gallery for $125.00 plus $12.00 for shipping to US addresses. It is sold unframed, but will fit a standard sized frame quite easily. October is the month of fog. I awoke this morning to a typical foggy Northwest morning. Keep the headlights on low, drive slowly, and watch the fog lift to a sunny afternoon. That's what I expect in October, and that is what happened today. 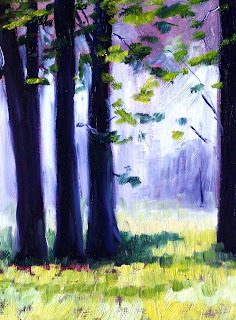 This little 5x7 inch oil painting was inspired by the early morning fog of October. I love the mystery and cool temperature of the fog and captured it in this painting. It was created on a 1/4 inch gessoed hardboard panel and will last a life time. This painting is for sale at Small Impressions Gallery for $50.00 plus $6.50 for shipping to US addresses. 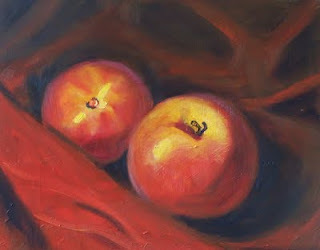 Peaches on red velveteen inspired this 8x10 inch classical still life oil painting. I wish the season of fresh peaches was still here, but since its gone, I can only dream of their juicy freshness. This painting is for sale at Impressions Gallery at 1000 Markets for $125.00 plus $12.00 for shipping to US addresses. It is joining some of my other still life oil paintings which range in size from 8x10 to 18x24 inches. 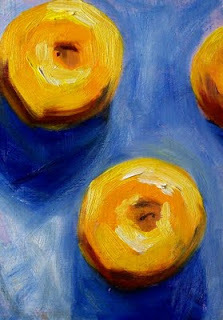 This morning I painted several little fruit paintings, but this one is one of my favorites. The skin isn't just purple, but has transparent red and orange with places that an opaque light blue tinges the surface. This painting is 6x6 inches on a canvas panel. It has SOLD, but I have other small paintings available for purchase at Small Impressions Gallery . Stormy weather kept me inside today, but it was a great day for painting still life. 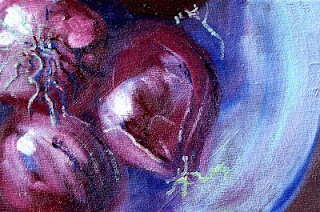 This little 4x6 inch oil painting of a bowl of purple onions was the result of today's efforts. It is painted on a canvas panel which provided a good texture. 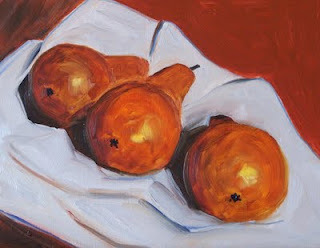 It has joined some of my other small still life paintings in Small Impressions Gallery at Etsy. It can be purchased for $24.00 plus $6.50 for shipping to US addresses by clicking on this link. The leaves are turning, the air is crisp, and the sun is dropping away much earlier. This is a season of mixed emotion. I love the colors of fall and the cool air, but I regret the passing of the long days of summer. This painting is a 5x7 inch oil painting on a hardboard panel. Find it at Small Impressions Gallery for $50.00 plus$6.50 for shipping to US addresses. Fall is in the air, but I'm contemplating snow. 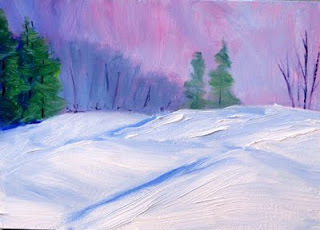 Today's little 5x7 inch landscape oil painting anticipates the coming winter season. It is for sale in the Small Impressions Gallery for $50.00 plus $6.50 for shipping to US addresses. She's finally dry. 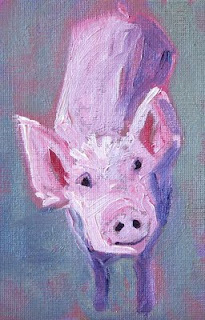 I painted this little 4x6 inch piglet painting several weeks ago and it seems like it has taken forever for her to dry. Logically I know there are good reasons why it took so long, but I'm still impatient when the drying time stretches into several weeks. The weather is beginning to cool off, the air is damper, I used some M. Graham paints which are made with walnut oil and take longer to dry, and this particular painting contained a lot of white which generally takes longer yet. Nonetheless, she is finally ready for placement in my Small Impressions Gallery and can be purchased for $24.00 plus $6.50 for shipping to US addresses. 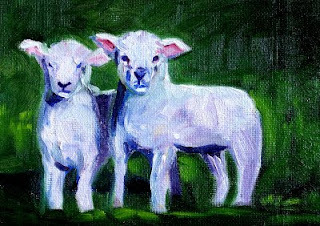 This pair of sheep wandered in to replace several other small animal paintings that recently sold. Selling my paintings keeps me motivated to paint more. As soon as I sell a painting, I feel compelled to paint more to make up for the empty space. When this 5x7 inch oil painting dried, it was going to join some of my other small animal paintings at Small Impressions Gallery , but it SOLD almost imediately. 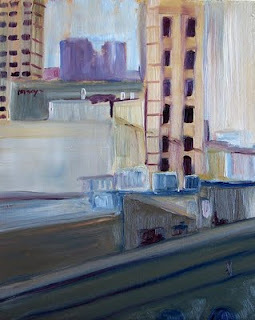 Today's painting is an 8x10 abstract cityscape from the Different Strokes Challenge . My usual subjects don't often include paintings of cities or skylines, but I took it on anyway. Painting it upside down relieved some of the stress of trying to paint a subject that is out of my comfort zone. When it was just about finished, I flipped the photo upright again and did a last bit of touch up. The painting turned out a little abstract, but I like results. It was a good challenge. 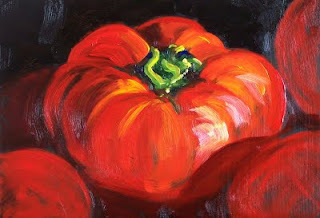 The beautiful heriloom tomatoes that are popular again inspired this 5x7 inch oil painting on a black gessoed hardboard panel. These antique tomato plants produce all colors and flavors of tomatoes that are usually only available at local farmer's markets or specialty stores. It is the end of the season for these and other summer produce; the weather prediction tonight is for the first freeze of the season which means all those green tomatoes need to be brought inside. Vine ripened tomatoes are finished. When this little oil painting dries, it will be placed in the Small Impressions Gallery with my other small still life oil paintings. 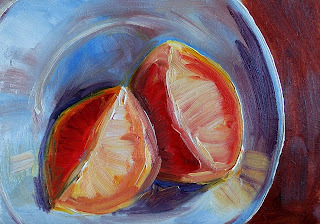 Orange wedges on a ironstone plate were the inspiration for this little 5x7 inch oil painting. The warm orange next to the cool plate forced me to take a second look. Loose brush strokes and thick paint slid off my brush as I created this little one. When it is dry it will be placed in Small Impressions Gallery with some of my other small paintings. Also, beginning on Tuesday, ten of my small paintings will be be on display at the Miniatures and Small Worlds Show at the Gallery at North Seattle Community College. A bicycle ride on a wonderful autumn afternoon inspired this little 5x7 inch oil painting. The crisp air and sunshine make outdoor activities delightful this time of year. This painting is for sale at Small Impressions Gallery for $50.00 plus $6.50 for shipping to US addresses. It is painted on a gessoed hardboard panel with professional grade oil paints and will last a life time. When the weather gets cooler, I start painting more still life work. Today's painting is an 8x10 on a gessoed hardboard panel. It was created with a mixture of both transparent and opaque oil color and was inspired by three Bosc pears on a linen cloth. The contrast between the golden skin and the white of the cloth attracted my attention. I worked with a loose brush stroke and enjoyed the creation of this painting. It has joined some of my other still life oil paintings at Impressions Gallery and can be purchased for $125.00 plus $12.50 for shipping to US addresses. If you are interested in small format paintings, please visit Small Impressions Gallery for work that is 8x10 inches or smaller. This little 5x7 inch oil painting is another of my black gesso still life paintings. The title is based on a Billie Holiday song, "Strange Fruit." It is a very haunting song, especially when the history behind the song is understood. 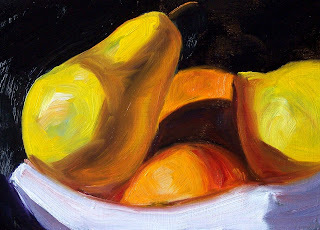 My little fruit painting borrows the name, but doesn't compare when it comes to artistic vision of the song's lyrics. When this painting dries, it will join some of my other small format still life paintings at Small Impressions Gallery. 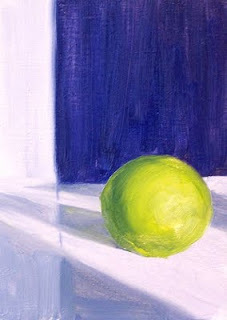 Today's little 5x7 inch oil painting was inspired by shadows and a bright little lime. It was a good exercise in values and color mixing. I'm debating whether to add some highlights to the lime when the paint dries. I've a while to think about it since oil paint takes quite a while to dry, especially when the whether cools. Eventually this little painting will join some of my other still life oil paintings at Small Impressions Gallery. It is painted on a hardboard panel that will last a life time. I also sell some of my still life oil paintings on canvas panels that are an affordable alternative to hardboard. Today's little 5x7 inch oil painting is a fun little abstract. I love the combination of blue and yellow and the abstract view. 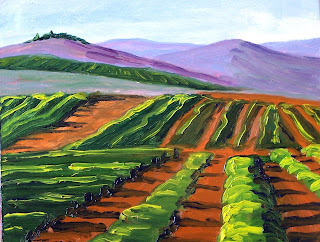 When I painted this, I was working on loose brush strokes and bold colors. It is for sale at Small Impressions Gallery for $50.00 plus $6.50 for shipping to US addresses. The mountains of Washington State are receiving their first dose of moisture this week. With the moisture also comes the fog. 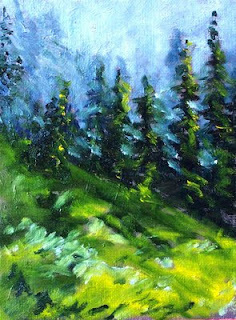 It is the fog of the Washington Cascade Mountains that inspired this little 6x8 inch oil painting on a canvas panel. When it is dry, I will place it in my Small Impressions Gallery along with some of my other affordable canvas panels.